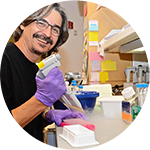 The Transgenic and Knockout Mouse Shared Resource provides members of the DCI with comprehensive and user-friendly services for the production of custom designed, transgenic and gene targeted mice, and the ability to cryopreserve these reagents for storage & distribution to the scientific community. The resource specializes in the microinjection of DNA/RNA (CRISPR) constructs into the pronucleus of fertilized mouse embryos and the genetic manipulation of pluripotent mouse embryonic stem cells (ESCs). DNA microinjection produces founder animals typically known as "transgenic mice." Introduction of ESCs with altered genes into the blastocyst produces animals that are colloquially known as "gene targeted mice." Using ESCs, the resource makes mice with point mutations, null alleles and deletions ("knock-out" mice), conditional mutations, and gene exchanges ("knock-in" alleles). These are powerful models for basic and translational cancer research. In addition, the resource has successfully produced Knockouts, point mutations & Knockins using cutting edge in vivo editing by injection of CRISPR constructs into mouse embryos. Attesting to the scientific impact of the resource, 139 peer-reviewed research papers from DCI members were published during the last funding period using mice generated by this Shared Resource and/or cells derived from them. The resource is organized into three specialized and experienced teams that provide: 1) Molecular Biology services, 2) transgenic and gene targeted mouse services, and 3) rodent husbandry services. Each team works in close collaboration with basic and clinician scientists to provide personalized technical support at all stages of the production process. This includes new approaches to conditional mutagenesis and the use of gene targeted ESCs and mice already available from other resources worldwide. Investigators can thus maximize project efficiency by taking advantage of complete services - from designing a gene mutation, targeting ESCs to produce genetically altered mice, or mutating mice by direct injection of CRISPR constructs into mouse embryos, expanding and cross breeding lines, and preserving the mice as frozen embryos and sperm—all by service groups located on the Duke campus. If a PI lab does not want to produce their own ESC targeting vectors the Molecular Biology team can design and produce by Bacterial Artificial Chromosomes (BAC) recombineering (recombination-mediated genetic engineering) technology a DNA vector for either direct or conditional gene manipulation strategies. BACs of either 129 or C57BL/6 strains can be requested. The design is done in full consultation with the DCI member's lab with a current wait time of about 2 months to start of project, on a "first come, first served" basis for DCI members. The Molecular Biology team can also provide complete services for CRISPR in vivo editing in mouse embryos. These services include cloning and validation of CRISPR guide sequences, production of CRISPR sgRNA via in vitro transcription, founder screening and subcloning of the individual alleles from founder mice. The Transgenic team can target three different mESC lines: a 129S6/SvEvTac, hybrid 129S6/C57BL/6N (G4) (preferred), and C57BL/6N. After selection, clones are screened using PCR and up to 18 positive clones are selected, expanded and frozen. After targeted clones are adequately confirmed by the BAC/REC team or by the PIs lab, the Transgenic team produces chimeras by microinjection. At least two different clones are injected and multiple high quality chimeras are usually obtained. To date, all targeting projects have gone germline. For some experiments the Transgenic team can subsequently modify validated ES clones by a transfection with Cre or Flp plasmids to effect recombination in vitro. The Transgenic service group also produces genetically modified animals by the traditional DNA microinjection method into the pronucleus of one cell mouse embryo. We have also successfully produce several models by CRISPR construct microinjection. Once DCI members have obtained targeted mice, they have the option of sending them directly to Traci Reddick in Rodent Husbandry Services for breeding and expansion of the colony. Her team can also cryopreserve embryos and/or sperm for long-term storage or distribution to collaborators. Additionally, if a DCI member needs to use existing mutant animals from an off campus source the rodent Husbandry service team can receive frozen embryos or sperm imported from outside groups, or rederive imported animal lines that do not meet Duke health standards. Even after mice have been transferred to PI labs the members of the Transgenic Shared Resource are available for consultation and clarification on advanced PCR screening and the subsequent breeding to other strains to obtain specific recombination of conditional allels. The resource has equipment associated with rodent housing, including appropriate cages and racks; microinjection set up, needle puller, dissection microscopes, cell culture microscopes, anesthesia device, incubators, PCR machines, centrifuges, and computers. The Transgenic and Gene Targeting Facility is available to all Duke faculty; if demand for facility services exceeds current capacity, DCI members receive first priority. Interested researchers submit a formal Service Request in order to initiate Facility activity, often after consultation with Facility personnel. Ms. Bock is responsible for assigning projects to resource personnel. Projects are addressed in the order received. To submit formal service request, please visit: http://www.tmf.cancer.duke.edu.